Tuesday March 2nd 1897 The boys went after corn today I was at work all day putting things to rights and some finishing work up stairs. It was late when the boys came to dinner In the evening I [illegible] to fix the [illegible]. Wednesday March 3rd 1897 We got the work done up and went up town. After doing our trading we went over home for dinner and brought Father & Mother home with us. We did the evening work and spent the time visiting. Mother [illegible] me [illegible] so nicely fixed and I have accomplished so much. Thursday March 4th 1897 Mother and I went over to see how Aunt Linda was this morning and found Aunt Liz there she came back with Mother to dinner. In the afternoon Aunt Ellen & Liz called and Willis & Carrie Anderson. The boys went after corn and were very late home to dinner I dressed a duck tonight to roast tomorrow It rained some today. 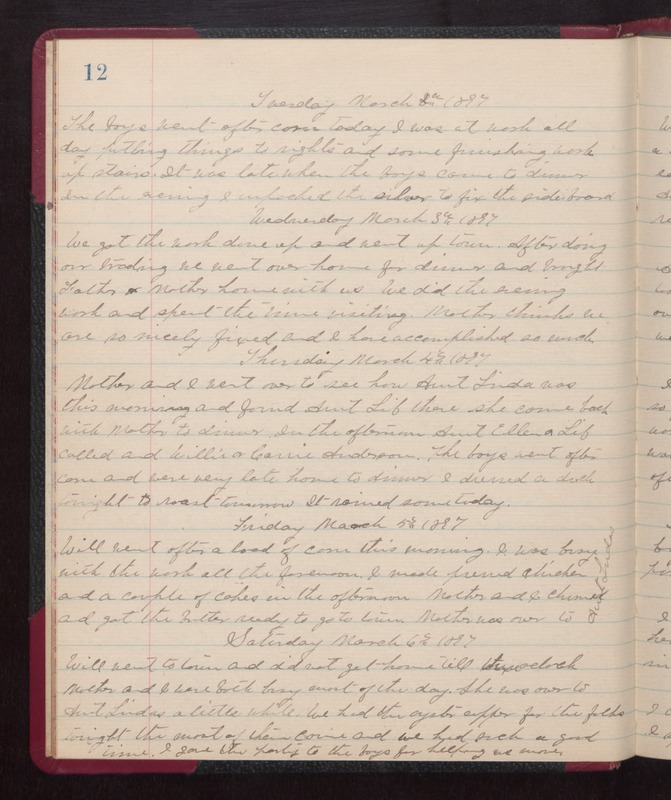 Friday March 5th 1897 Will went after a load of corn this morning. I was busy with the work all the forenoon. I made [illegible] chicken and a couple of [illegible] in the afternoon. Mother and I churned and got the butter ready to go to town. Mother was out to Aunt Lindas Saturday March 6th 1897 Will went to town and did not get home till [illegible]. Mother and I were both busy most of the day. She was over to Aunt Lindas a little while. We had the oyster supper for the [Fohls] tonight the [most of [illegible] came and we had such a good time. I gave the [illegible] to the boys for helping me some.